FIrst Aid for Nosebleeds - Do you need help and info? It is best to sit upright and lean forward during nosebleeds. By staying upright you reduce blood pressure in the veins of the nose. The upright position will give the clot a better chance of forming as laying down increases the blood pressure in the nose and may hinder clot formation. Sitting forward will help avoid swallowing blood, which can irritate the stomach and make the person feel sick. Tilting the head back can block the airway and cause difficulty breathing. Also the blood going down the throat may cause the person to cough, therefore increase the blood pressure in the head, which may dislodge any clot that is forming. Then we are back at square one. Pinch the soft/lower end of the nose, below the bony part. This is usually easiest with a thumb and index finger. Hold the nose closed for at least 5 minutes before checking. If it has not stopped then pinch for another 10 minutes before checking again. Do not check before then as the clot needs time to form. You will need to breath through the mouth. NOTE:- the purpose of applying pressure is to help the blood form a clot at the wound site. The less blood flow the quicker a clot can form. This is the body's natural way of forming a "cork" to block the blood from exiting, much in the way a cork stops wine from leaving a bottle. Tissues may be needed or a damp cloth to "catch" the oozing blood. It is debatable if ice or a cold compress placed around the nose helps. Any drug application should been done under medical advice. Once bleeding has stopped do not remove any clotted blood that remains in the nose or blow the nose. This can be very tempting as the nose can feel blocked and difficult to breath through but resist as re-bleeding can occur so easily while the area is still fragile. Avoid bending over for several hours as lowering the head increases the blood pressure in the nose and may dislodge the clot and bleeding may recommence. This can also be said for lying down. 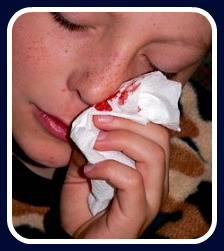 If bleeding starts again blow the nose hard to dislodge and remove any blood clots and start the process again. If re-bleeding occurs and the bleeding does not stop again in 10 minutes. If nosebleeds keep occurring to find the underlying problem. If bleeding from the nose occurred because of an accident or blow to the head the person may need to be examined to rule out any other head injury. If the affected person is taking anti-clotting medication, including aspirin or warfarin or the like, the dose may need adjusting. Please do not take the person off the medication as they will have been put on it for a good reason, so they will need to consult their doctor.